I am a little skeptical when ‘desi’ (read Indian) restaurants in Dubai claim themselves to be ‘authentic’. The poor adjective has been as abused as french fries. Let’s face it, it will be a little difficult to con a ‘desi’ boy with the same tomato-based gravy. So, when another new restaurant launches itself, stressing on how authentic they are, I usually take it with a bag of salt! Then along came yet another restaurant that proclaimed to be as authentic as it gets. It was called Q’s Cuisine. Honestly, I was rather suspicious with a name like that serving traditional Awadhi dishes. 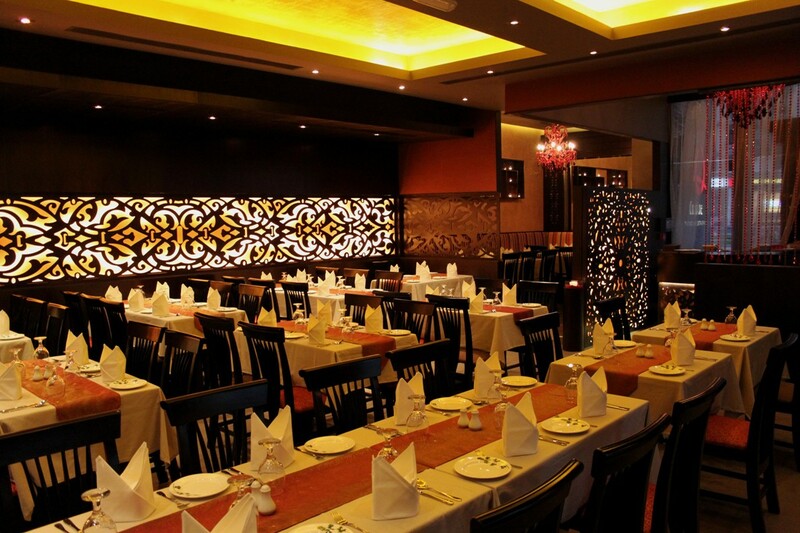 Deeper inspection revealed that Q stood for Qureshi – the family that made Awadhi cuisine popular. That, was the decider! The ‘shortening’ of name was probably to make it more ‘sticky’ in consumers’ heads. Their claim to fame were recipes that were tasted by the royal palettes of the Nawabs of Oud or Awadh (modern-day Lucknow in India). Now that is a strong claim to make, something that only be approved by the taste buds. Me (and my radio team) were graciously invited over for a food-tasting at the restaurant. The newly opened outlet is near Lamcy Plaza, next to Spinney’s. The exterior looked dark, by design interspersed by burnt amber, maybe to denote the colour of burning embers. The interiors carried on the amber theme with some flowery wood-work, comfortable seating and pleasing music (not live music, thank god). I must say that we felt at home with everybody serving with a smile. While we were warming up with ‘papad’ and mint chutney, I was planning my marking scheme. You see, the menu served in any decent restaurant is no less than an answer sheet in university. You need to set the limits to check. Parameter 1: Check for Kebabs. This is probably the easiest mainstay for most desi restaurants. And while mentioning kebabs, I settle for the ‘Gilawati’ Kebab. This is a specialty that comes from Awadh. History has it that the Nawab had weak teeth but a strong desire to have meats. The royal chef came up with this innovation that still rules the list of kebabs. So, these kebabs are made of tenderised mince meat, so soft that they bruise at the slightest touch. The mince is a beautiful mix of spices like green cardamom and the unmistakable saffron or ‘zafran’. In Dubai, there is only one other restaurant where I have my fill of ‘Gilawati’ kebabs. It was now time to see, if their kebabs had that special binding. The Gilawati roundels were served on mini flat breads (as is customary). It smelled great. Fried to perfection. A slight flick of the fork bruised the kebab beautifully. The mince was a wondrous silky mix of the finest meat, spices and the right amount of saffron. ‘Melts in the mouth’ gained the right meaning with the G-kebabs served at Q’s Cuisine. The other kebabs doing the round were certainly A-listers but the Gilawati was exquisite. Makhmali Murgh Kebab (tender pieces of chicken marinated in spiced up curd) definitely shone through. Kakori Kebabs made a special appearance but it could not shake my loyalti for the G-Kebabs! There are kebab options aplenty for the vegetarian diner. A must-try is the ‘Ashrafee’ or coin. Small coin shaped patties of sweet corn and cottage cheese and herbs make for a flavourful beginning. There also was Dahi Kebab – a tough preparation made from hung curd. I have had better dahi kebabs, although this wasn’t bad at all. Kebabs done, I was ready for the main course. Of all the pots and baskets that were kept in front of me and my team, I made a quick dash for the Dal Bukhara. Parameter 2: I always judge a restaurant (or a homely kitchen for that matter) by the lentils they make. The simplest is often the toughest. And then again, the Dal Bukhara wasn’t the easiest of things to prepare. It is often labelled, inter-changeably as Dal Makhni. They are not the same. Black lentils, cooked for long hours over a slow fire and served with a generous swirl of cream is an undying favourite for the discerning North Indian diner. The Dal Bukhara is the Afghani touch to the recipe that uses a certain type of lentil called ‘urad’. Dal Makhni uses 50% of urad along with red kidney beans and Chana Dal (split Bengal Gram). Right, end of class! The dal is on the plate now! I couldn’t speak for sometime. That was when, the warm, thick Dal Bukhara was oozing inside my mouth. Totally warms your heart! And for those who have had the same in India or Pakistan, would be happily wallowing in memories of ‘that’ dal back home! Bulls-eye! What came next was the delicate but arduous mutton ‘Nihari’. No classes here, but a deep satisfaction when you relish the fine textured gravy! Mmmm! Tender pieces of ample mutton on the bone served with piping hot baskets of roti! Bliss! One must mention that me and my 7-man army were happily stuffed. We were not hungry but it was tough for us all to stop the momentum of our hands going to our mouths. It was here that a big pot of ‘Kachchey Gosht Ki Biryani’ or tender mutton biryani was circulated. Mildly spiced fragrant rice with tender pieces of mutton cooked to perfection is well recommended. We started trooping out when we were called back! A few thought they had to ‘do the dishes’. Truth be told, the smiling army serving us said that dinner was incomplete without dessert!!! We settled like well-fed cats on our chairs, as pots of ‘Firni’ (rice pudding with saffron, cardamom and nuts) were served to us. For those that know, this is a sweet that is humble, compared to some famous and showy varieties of dessert but when well made, could defeat any glitzy, preposterous sweetmeats. Arguable, the best ‘Firni’ in Dubai! They say, the mark of good food is when it shuts you up naturally. Smile on our faces, me and my team walked out of Q’s Cuisine like pregnant penguins! Truly, the soul of Awadh in the heart of Dubai! In case you want to swing by or order over phone, you can call 04 388 5052.